And those are just SOME of the benefits that your baby will receive from your breast milk. Breastfeeding strengthens our family, our community and our future. Just because breastfeeding is natural doesn't mean it's always easy. It is completely normal for mothers to have some difficulty or questions about getting the baby to latch on during the first few days after birth. Once breastfeeding is established, it's easy! Putnam County WIC is here to help you with any questions, concerns or issues you have regarding breastfeeding, latching, breast milk storage and pumps/pumping. To get breastfeeding off to a good start, learn all you can about breastfeeding during your pregnancy. Putnam County WIC hosts a FREE Breastfeeding Information Class on the 2nd Thursday of every month at the Florida Department of Health in Putnam County. During the class we discuss latching, positioning, benefits for mother and baby, milk storage tips and common myths about breastfeeding. We encourage our clients to bring whoever their support system will be, whether it's your best friend, mom, partner or grandparent. Every 2nd Thursday of the month at 2 P.M.
Mommy Cafe group every Monday at 1:30 p.m.
Did you know that the amount of food you receive as a mother on WIC depends on how you decide to feed your baby? Fully Breastfeeding: Fully breastfeeding is the healthiest choice for you and your baby. Moms who are fully breastfeeding will stay on the program for 1 year after the baby is born. 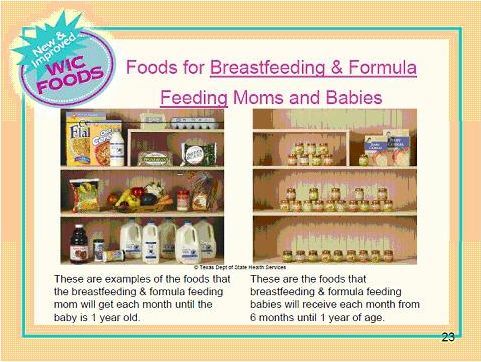 Because fully breastfeed infants do not receive any formula from WIC, moms and babies will receive a lot more food. Partially Breastfeeding: A mom who does not fully breastfeed her baby can get some formula from WIC. But, she will get less food for herself and less baby foods later on. WIC will only give a limited amount of formula. Mom needs to build a good milk supply in the first month so she can supply all her baby's needs and avoid the need to purchase extra formula. A mom will be able to stay on the program for 1 year after the baby is born as long as she continues to breastfeed. Fully Formula Feeding: Moms who are all or mostly formula feeding will get different amounts of formula depending on the age of the baby. Babies will begin receiving baby fruits and vegetables and baby cereal at 6 months of age. 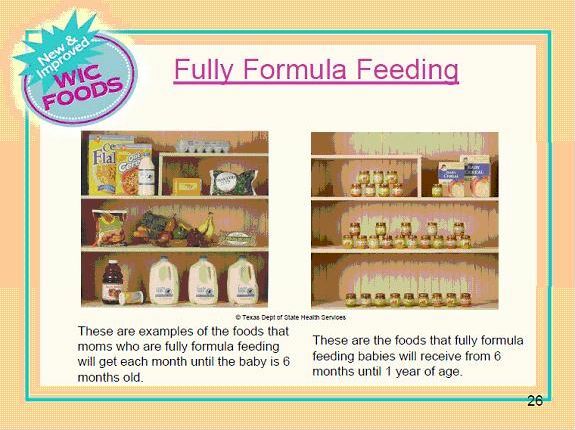 Moms will receive foods for themselves from WIC until the baby is 6 months old. Note: WIC is a supplemental nutrition program. 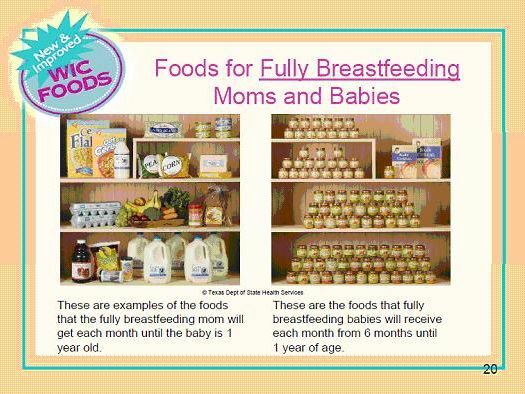 WIC does not provide all the food your baby needs.